Don't think Microsoft are letting up on the 360 bundles this Christmas. They're just getting started. The latest official pack-in deal - exclusive to Sam's Club - is not only the biggest bundle deal we've ever seen, but potentially also the best value. 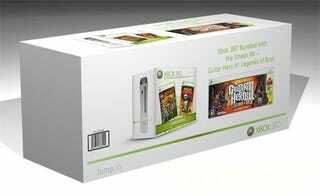 For $349 you get a 60GB Pro console, Lego Indiana Jones, Kung Fu Panda and Guitar Hero III. The full, comes-with-guitar version of Guitar Hero III. With the 60GB unit normally costing $299 by itself, $50 for those three games constitutes what we like to call a bargain. It'll be out mid-November.